It is becoming apparent from a variety of sources that the work of the National Commission on Space, coupled with excellent work inside NASA and in European, Soviet and Japanese space agencies, has brought about a quantum change in experts’ perceptions of how we should enter the trans-terrestrial environment. Professionals now quite generally accept that we must make the fullest practical use of non-terrestrial materials to bootstrap our way outward. In that much-improved climate of expert opinion, SSI’s research programs take on an even more immediate value. The fundamental resources available in the trans-terrestrial environment are the rich, constant flow of energy from the Sun, and the materials on the trans-terrestrial bodies. As written by the Space Commission, the logical sequence of development for the new resources is to begin with those closest to Earth and progress later to those farther away. The closest by far are those of the Moon, our sister-planet, which remains fixed in the gravitational vice of our Earth, and is correspondingly accessible at all times. All other known resources, such as the moons of Mars, are about one thousand times farther away, and would take a correspondingly greater and much more time-consuming program to reach. We know already that materials vital for space propulsion and for construction are abundant on the Moon: lunar glasses for composites, oxygen for propellants, silicon, iron and aluminum for building factories and power satellites to serve the Earth from high orbit. What we don’t know about the Moon is exactly the point of one of SSI’s “Breakthrough Projects,” the design of a space probe to enter and remain circling in a low orbit over the poles of the Moon. That “Lunar Polar Probe” would be a simple spacecraft, designed to focus on a specific, vital question: are there frozen volatile materials, the life-giving elements carbon, nitrogen and hydrogen, trapped as kilotons of permafrost in the deep craters near the lunar poles, craters which have never seen the warmth of sunlight in millions or even billions of years? Theory, by leading space scientists working over a period of more than 20 years, says there should be. The Lunar Polar Probe would find the rich lodes of life­giving elements if they are there. In keeping with SSI’s philosophy of focusing on specific vital questions rather than diffusing effort over many, the Lunar Polar Probe would carry only a small number of instruments. Concentrating in that way on one problem rather than many, it could be inexpensive: according to studies funded by SSI, only about $50 million, plus the cost of launch, instead of the billion dollars or more that a multi-function space platform, satisfying many desires, would cost. With cooperation from SSI, NASA and possibly the space agencies of other nations, by the very early 1990’s the Lunar Polar Probe could be in permanent circling orbit above the Moon, relaying back data in seconds to the Earth. It would be our “Prospector” for the now ­hidden lunar resources. 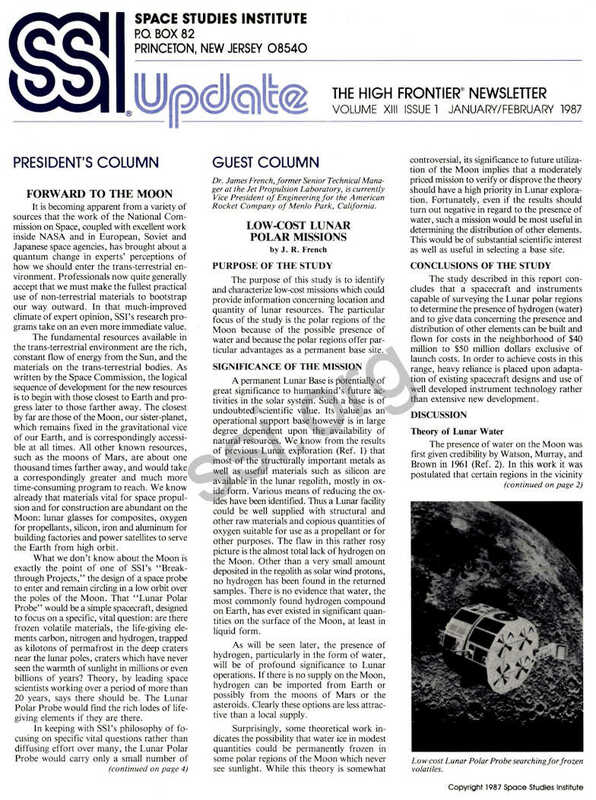 The National Commission on Space named a goal of high priority, to be met as soon as possible in NASA’s program: that is the Robotic Lunar Return vehicle (Figure 1, Page 15 of the Commission’s Executive Summary). That vehicle is targeted for operation in about 1998. Logically it fits beautifully with the Lunar Polar Probe. In the few years after the Probe first returns its findings to the Earth, entities such as SSI, entrepreneurial new companies, or divisions of major companies and agencies here and abroad can develop robotic, tele-operated mini-factories, to make use of the newly-found lunar resources to benefit the space programs of all nations. The Robotic Lunar Return vehicle will then come into operation, if on the Commission’s schedule, at just the right time to emplace those mini-factories on the Moon. Tele-operation, the direction of those factories by workers here on Earth, is practical for the Moon for two critical reasons: it takes only 2.6 seconds for a television signal to arrive here from a lunar factory and for a resulting command signal to return to the Moon directing action in response; and the Moon remains in gravitational lock, always presenting the same face to us, rather than rotating in a manner that cuts off communications. Dr. James French, former Senior Technical Manager at the Jet Propulsion Laboratory, is currently Vice President of Engineering for the American Rocket Company of Menlo Park, California. The purpose of this study is to identify and characterize low-cost missions which could provide information concerning location and quantity of lunar resources. The particular focus of the study is the polar regions of the Moon because of the possible presence of water and because the polar regions offer particular advantages as a permanent base site. A permanent Lunar Base is potentially of great significance to humankind’s future activities in the solar system. Such a base is of undoubted scientific value. Its value as an operational support base however is in large degree dependent upon the availability of natural resources. We know from the results of previous Lunar exploration (Ref. 1) that most of the structurally important metals as well as useful materials such as silicon are available in the lunar regolith, mostly in oxide form. Various means of reducing the oxides have been identified. Thus a Lunar facility could be well supplied with structural and other raw materials and copious quantities of oxygen suitable for use as a propellant or for other purposes. The flaw in this rather rosy picture is the almost total lack of hydrogen on the Moon. Other than a very small amount deposited in the regolith as solar wind protons, no hydrogen has been found in the returned samples. There is no evidence that water, the most commonly found hydrogen compound on Earth, has ever existed in significant quantities on the surface of the Moon, at least in liquid form. As will be seen later, the presence of hydrogen, particularly in the form of water, will be of profound significance to Lunar operations. If there is no supply on the Moon, hydrogen can be imported from Earth or possibly from the moons of Mars or the asteroids. Clearly these options are less attractive than a local supply. Surprisingly, some theoretical work indicates the possibility that water ice in modest quantities could be permanently frozen in some polar regions of the Moon which never see sunlight. While this theory is somewhat controversial, its significance to future utilization of the Moon implies that a moderately priced mission to verify or disprove the theory should have a high priority in Lunar exploration. Fortunately, even if the results should turn out negative in regard to the presence of water, such a mission would be most useful in determining the distribution of other elements. This would be of substantial scientific interest as well as useful in selecting a base site. 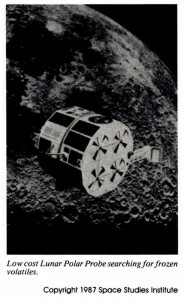 The study described in this report concludes that a spacecraft and instruments capable of surveying the Lunar polar regions to determine the presence of hydrogen (water) and to give data concerning the presence and distribution of other elements can be built and flown for costs in the neighborhood of $40 million to $50 million dollars exclusive of launch costs. In order to achieve costs in this range, heavy reliance is placed upon adaptation of existing spacecraft designs and use of well developed instrument technology rather than extensive new development. The presence of water on the Moon was first given credibility by Watson, Murray, and Brown in 1961 (Ref. 2). In this work it was postulated that certain regions in the vicinity of the Lunar poles which are never exposed to the sun may be at temperatures below 120°K. Such areas might then function as cold traps, collecting and permanently freezing any volatiles which may be present which are solid at these temperatures. This would certainly include water and possibly carbon dioxide as well. Arnold (Ref. 3) estimates that the temperature might be as low as 40 °K. If this is the case, even methane and other low ­temperature volatiles might be trapped. The permanently shadowed areas: the bottoms of deep craters, rilles, crevices, etc., are estimated to total as much as 2×105 km in area. Such areas might be found as far from the poles as 60° latitude although the geometry of the situation obviously favors locations nearer the poles. Two sources are usually postulated for Lunar water. One is simply the primordial cloud from which the Moon originally condensed. The prevalence of water in the solar system gives clear evidence that water was a major constituent in the makeup of the planets. It would be remarkable indeed if the Moon had condensed without water. In the case of the rocky inner planets most of this original water was outgassed and a good deal was lost. In the case of Earth and Mars however some was retained. The Moon is small enough that it is probable that most of the primordial water was lost except perhaps at some depth in the interior. This water could occasionally be brought to the surface by volcanism or major meteoroid strikes. Much of this water would be lost to space. However as it spread around the planet, some would be trapped in the shadowed regions. It is interesting to note that this may still be taking place to some extent. If the rather controversial Lunar Transient Events are indeed volcanic venting then the process is still at work. Another postulated source of water is cometary impact. Such bodies, composed of a high percentage of water and other volatiles would be vaporized by the impact. The vapors would migrate around the Moon (Ref.4) restrained by its gravity until they escaped due to random motion of the molecules heated by the sun, accelerated by decomposition of molecules such as water into its constituent elements by solar ultraviolet. During the time required for this to take place some fraction of the original molecules would be trapped in the shadowed regions. A critical question in regard to this theory is how long the Lunar poles have been where they are. Obviously most of the outgassing of the original water must have occurred early in the Moon’s history. Similarly most of the impact cratering was concentrated in the first one or two billion years. If the Lunar poles were in their present location 4.5 billion years ago and there has been no intervening migration then the cold traps have been in operation for essentially all of the Moon’s history including the Mare-forming events thus leading to the maximum possible accumulation of volatiles. It is generally considered improbable that this is the case. In Ref.3 Arnold postulates that the poles may have become fixed at the present sites some 3 billion years ago. This is well after the major outgassing phase and after the Mare-forming events. Based upon the 3 billion year number, an estimated outgassing rate, and the estimate of the percentage of migration of molecules and cold trapping from Ref. 4, Arnold estimates that the amount of ice accumulated might be about 1 meter in thickness over the shadowed area. This equates to 100 cubic km or about 1011 tons of water. It is clear that, even if these estimates are optimistic by two or three orders of magnitude, the amount of water which may be available dwarfs anything which we can even conceive of importing from Earth or from other space sources. One should not, incidentally, expect that analogs of the shining polar caps of Earth lie hidden in the dark regions of the Moon. The surface of the Moon is constantly being “gardened” by micrometeoroid impact. This stirring and overturning would tend to intermingle the dust and rock. The negative side of this is that each impact will vaporize some water of which some may be lost. On the positive side, a layer of dust would accumulate on the surface in this scenario, providing thermal insulation and protection from later impacts. In fairness, one must end this discussion of possible cold trapped water by pointing out that some scientists contend that there is no such water. Lanzerotti, for example, contends that sputtering by solar wind particles would remove the cold trapped water as rapidly as it is laid down. Another less prominent theory concerning lunar water offers that it could be widespread. Muller (Ref. 5) notes that the Lunar subsurface temperature is below 0° C at fairly shallow depths and that a 100 meter overburden of Lunar soil could preserve ice for geologic time. Thus if the Moon so developed that a percentage of the primordial water remained in the interior while the surface and top tens of meters was thoroughly outgassed and desiccated, large amounts of water could be available near the surface in many areas of the Moon. Near the surface, water could only exist as ice, at greater depth the temperature begins to rise again and liquid water could possibly exist at some depth beneath an overburden of dust, rock, and ice. While it would seem difficult to detect liquid water at such a depth without drilling, we have already flown an instrument in Lunar orbit capable of making such a detection. In fact it may have done so. 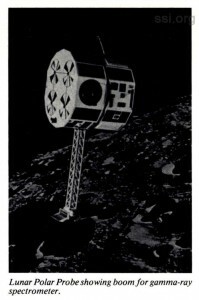 The radar sounder flown on one of the later Apollo missions had the capability of penetrating to considerable depth through very dry rock; It would also penetrate through ice buried in the rock without detecting the difference since the dielectric coefficients are very similar (3 for ice, 4 for regolith). It would not penetrate through liquid water which has a high dielectric coefficient (about 80). In fact the sounder would see a very bright reflection off a water layer and would be unable to see beyond it. The sounder observed exactly this phenomenon in both Mare Crisium and Mare Serenitatis. The reflecting layer came up from deep beneath the mare to within 200 to 1000 m of the surface near the shore. The subsurface water explanation of the observed data is not accepted by the scientific establishment and it may well be that other, more prosaic explanations exist for these observations. However the existence of a liquid water layer is at least a possibility and worthy of further investigation. The apparent lack of Lunar hydrogen was discussed briefly in an earlier section. This lack has a profound significance in regard to long term utility of the Moon as a support base for space operations. Simply put, hydrogen is the basis for all high energy fuels for rocket engines. It may be used by itself or in various energetic chemical compounds such as methane (CH4) and other hydrocarbons, metal hydrides such as diborane (B2H6), etc. Hydrogen holds this unique position because of its very low atomic weight and highly exothermic reactions with most oxidizers. In fact very few practical fuels exist which do not contain hydrogen. One such is carbon monoxide (CO). 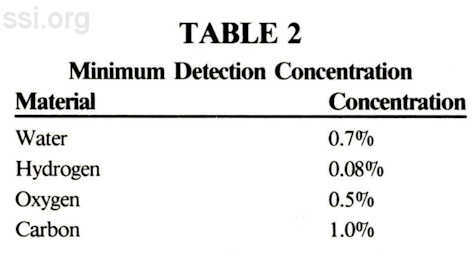 Table 1 presents performance data for several propellant combinations for comparison. While the arguments presented in the preceding paragraph are not exhaustive, they clearly indicate that, if propellant manufacturing in large quantity is to take place on the Moon, the presence of hydrogen is most important. If only oxygen can be produced as a result of ore reduction, it will still be significant but clearly of less importance than ability to generate both oxidizer and fuel. The significance of water in the life support system of a Lunar Base is obvious at the simplistic level in that human and most other forms of Earth life depend upon the availability of water. However, in terms of basic life support, the amounts are relatively small on a per-person basis and closure of the water loop in a life support system is one of the easier aspects of life support system design. Thus for simple survival, availability of Lunar water may not be of great significance since it could be imported from Earth except pethaps in the case of very large populations. It can be argued however that the availability of generous quantities of water can greatly enhance the quality of life and ease of function within a large permanent base. People require recreation and relaxation and the ability to provide such apparently “frivolous” amenities as swimming pools, decorative ponds and fountains, plenty of water for baths and showers should not be overlooked as a morale factor. Similarly, generous amounts of water for washing, cleaning, sewage transport, portable radiation shielding, and other uses can greatly facilitate base operations. On Earth, water is a major component in many manufacturing processes. It can function as a cooling or heating agent or heat transfer medium and as a diluter, carrier, or reagent in a variety of chemical processes. The hydrogen and oxygen which can be obtained from water are equally useful as chemical reagents in various chemical operations. Examples include use of hydrogen in reducing ores and oxygen in the combustion of waste products into harmless oxides. While a variety of innovative techniques have been devised for carrying out industrial processes without water, the ready availability of water will make it much easier to apply well understood techniques now used on Earth to Lunar operations. The primary instrument which is usually considered for a mission of this type is the gamma-ray spectrometer. This instrument depends for its function on the detection of gamma rays which are emitted from all bodies in the solar system. The original source of the energy is cosmic rays which penetrate the mass and in decelerating deposit energy in the mass in the form of orbital electrons excited to a higher than normal energy state. When the electrons decay back to their normal state the energy is emitted as a gamma ray. The energy of the gamma ray is characteristic of the specific atom from which it is emitted. Therefore, if the gamma rays can be detected and sorted according to energy then it is possible to derive what atoms in what percentage make up the mass from which the rays are being emitted. Several problems arise inherently from the nature of the gamma-ray spectrometer. The number of gamma rays given off depend upon the intensity of the incident cosmic radiation. Since this is relatively low, the emitted gamma ray flux is also low. Since this is a characteristic of the universe, there is nothing which can be done about it except to accumulate data over a long period of time. Common materials can be detected reasonably quickly while less common ones require long integration times. Another problem is the lack of discrimination. Since all objects in the solar system are bombarded by cosmic rays, all objects give off gamma rays and therefore will be detected by the gamma-ray spectrometer. This means that the instrument is not only measuring the elemental composition of the astronomical body in question but also of the spacecraft which brought it and even of itself. In order to distinguish the signal from the target planet the instrument must be calibrated by reading this background signal while it is in deep space far from the planetary body. Even this does not completely solve the problem since the process of burning propellant to enter orbit will change the background because of the removal of the propellant mass. While all this complicates the issue, careful mission design and data analysis can still provide a useful result. Because of its sensitivity to background radiation from the spacecraft and because the more sensitive detectors must be maintained at a low temperature (as low as 90 °K) the gamma ray spectrometer will most probably be mounted on a boom which will place it some two meters from the spacecraft. This remote placement aids both problems since gamma ray intensity decreases with distance from the source. (For a point source the rate of decrease is as the square of distance however typically the spacecraft will be too large and too close to appear as a point source.) The thermal requirement is aided by the fact that the detector is isolated from the heat generated by electrical activity in the spacecraft. By careful thermal isolation from the spacecraft, prevention of energy from sunlight, earthlight or moonlight from reaching the detector, and design of a radiator to reject any internally generated heat to space it is probably possible to cool the detector to the desired temperature without active refrigeration. This is desirable from considerations of reliability and weight reduction. If necessary refrigeration of the detector can be provided by a variety of means. The most reliable is probably thermoelectric cooling since it requires no moving parts or consumable substances although fairly inefficient. Even given the complications discussed above, the gamma-ray spectrometer appears to be the instrument best suited to detection of water and other volatiles in the lunar polar regions. It is quite sensitive to hydrogen and many of the other lighter elements which would be expected to constitute deposits of volatiles. Because gamma rays are emitted from the bulk of the material, elemental abundances are sensed to some depth beneath the surface (limited by self shielding of the gammas by the material itself), usually about half a meter. Thus even if a layer of dust overlies the volatiles they will still be detected if within a half meter of the surface. This would seem probable for cold trapped materials. Given adequate observing time, the gamma-ray spectrometer can also provide an abundance map for a variety of other elements. 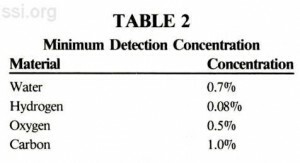 Table 2 shows sensitivity of the instrument to the elements. No other instrument capable of operating from orbital altitudes can provide elemental data equivalent to that available from the gamma-ray spectrometer. Because of the lack of atmosphere and the large area to be surveyed, orbital exploration is the only practical approach. Therefore, any mission dedicated to the discovery of cold trapped polar volatiles will include a gamma-ray spectrometer regardless of other instrumentation. The second half of this paper will appear in the March-April issue of the UPDATE. The 8th Biennial SSI/Princeton Conference on Space Manufacturing, sponsored by Space Studies Institute, is a forum for papers on all aspects of the use of non-terrestrial resources. The program includes papers both on technical aspects of space development and on the social sciences. In order to accomodate a broad range of presentations, three different types of presentation will be encouraged: 1) the traditional presentation of papers in the auditorium at the Woodrow Wilson School, 2) a poster session and display, 3) an evening round table for interaction between participants. The first three days of the Conference will be open only to registered participants. A summary session on Saturday, May 9 is free and open to all. A registration fee of $290 includes lunches, coffee breaks and the Friday night banquet. Registration through the Space Studies Institute is available. If you would like a registration package please send your name, address, and affiliation to: Ms. Barbara Faughnan, Conference Coordinator, SSI, P.O. Box 82, Princeton, NJ 08540.